Bond Classroom Solutions is pleased to announce its solution to the urgent need for additional classrooms. We will construct our more attractive classroom buildings on your school site faster and more cost effectively than modular classrooms can be manufactured and delivered. In addition, our solution is attractive permanent hurricane, earthquake, fire, termite, and mold resistant. As we are all aware, portable and re-locatable modular classrooms are rarely moved before they have deteriorated to the point of requiring removal and disposal. As highlighted to the left, the many advantages of our permanent classroom buildings are evident as a highly desirable alternative. Perhaps the most persuasive advantage our permanent classroom buildings offer is the perfect classroom layout with a wide variety of building configurations. Since our classrooms are constructed on site, they are not limited to the dimensions of a concrete doublewide mobile home (24 feet by 40 feet providing 960 square feet) delivered over the road. With the portable and modular alternatives, if the front of the classroom is at one end, the students in the back have difficulty seeing the board. If the front is on the long side, then the students at the far right and far left have to crane their necks to see the board. In contrast, our classroom shape mirrors an ideal classroom environment (30 feet by 32 feet providing the same 960 square feet). Our system provides ceiling height flexibility with an ideal height of nine feet, rather than the modulars' eight feet, in order to give the classrooms a more spacious ambiance. Our solution is not limited to stand-alone classrooms standing side-by-side like the modular or portable alternatives. 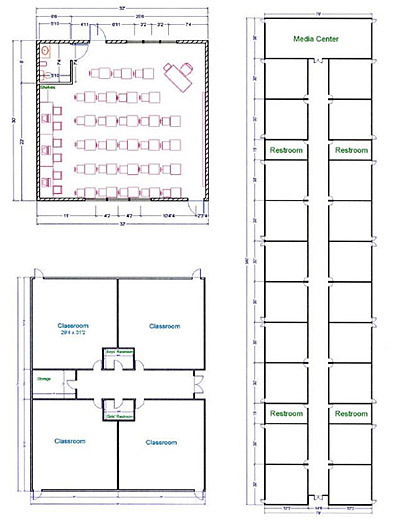 If a school needs 20 new classrooms, we can cost effectively offer numerous solutions such as: 20 stand-alone classrooms, 10 duplex classroom buildings, 5 quadruplex classroom buildings, two 10 classroom buildings, or one 20 classroom building with a central hallway, group restrooms, and a large meeting room or media center. Every classroom will also have its own emergency exit to the outside for added safety. The many choices that will best serve your school's needs are yours to make and we can quickly and cost effectively deliver your ideal set of classrooms. ©Copyright 2019 www.bondbuildingsystems.com All Rights Reserved.